A Times of London article by Gregg Carlstrom published on Feb. 8th (in the print and online editions) on the settlement legalisation law, which legalises Israeli settlement homes built illegally on privately owned Palestinian land, included the following claim. The bill, which legalises about 4,000 homes built in dozens of locations on privately owned Palestinian land without compensation for the owners, was passed in the Knesset late on Monday night by a 60-52 vote. The claim that Palestinian land owners won’t be compensated is repeated in the photo caption. However, every other major news story that we read on the extremely controversial bill reported that it does include compensation (in land or money) to the Palestinian land owners. In fact, here’s the relevant Hebrew text of the bill from the Knesset’s website. It says that a Palestinians who proves ownership of the land is entitled to financial compensation of 125% of the land value, or an alternative plot of land, according to his or her choice. Last night, we tweeted Carlstrom but didn’t get a reply. An hour later, we later contacted Times of London editors to lodge an official complaint. We’ll keep you posted. Just a few minutes ago, we received word that the paper had corrected the false claim in the online edition. Here’s the new text. The bill, which legalises about 4,000 homes which were built in dozens of locations on privately owned Palestinian land without compensation for the owners, was passed in the Knesset late on Monday night by a 60-52 vote. Under the terms of the bill, if the owners are unknown the government will be able to appropriate land for its own use. If the owners are known, they will be eligible for some kind of compensation. Here’s the note on their Corrections page. 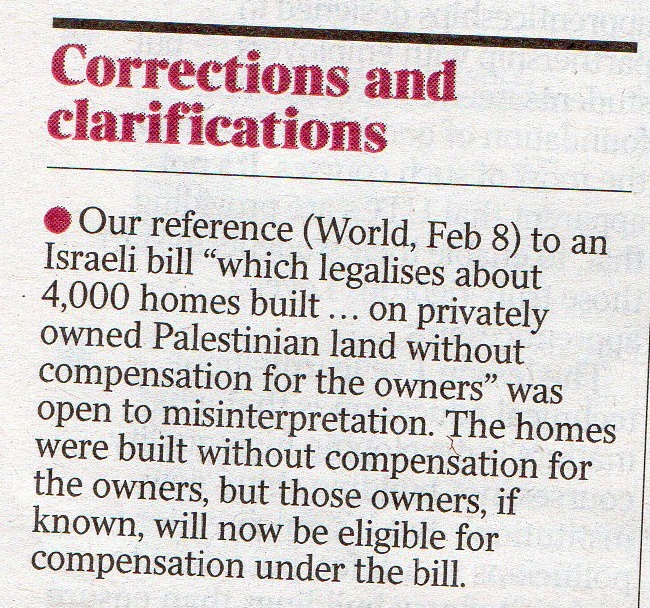 Our reference (World, Feb 8) to an Israeli bill “which legalises about 4,000 homes built . . . on privately owned Palestinian land without compensation for the owners” was open to misinterpretation. The homes were built without compensation for the owners, but those owners, if known, will now be eligible for compensation under the bill. The correction in the print edition appeared on page 28, and ran on Feb. 10th. “Some kind of compensation” implies less or lower value. They do not deserve any commendation unless there is an accurate correction. Just for the record, I am no sock puppet. This Michael and Michael Bregman are the same person. Autofill sometimes does this. PS: Good work on your part, however – as always . If the “owners” of the land are not known to the government, then who precisely is bringing the claim before the court? I would think that only the party in interest could do so and, if it is an NGO, that entity would be acting on behalf of and with the consent of a specific individual. The larger point is, I think, that international law does not prohibit taking land and compensating the owner, though for the most part it must be for a public benefit. Under US jurisprudence, that has become a pretty broad concept. The narrower point is the legality of the underlying Jordanian law that allowed for the wholesale redistribution of land, including private land held by Jews who where ethnically cleansed and – it should go without saying – were offered no compensation, to these “owners” known or unknown, If anything, the Times article correctly described the Jordanian law not the proposed Israeli one, and it seemed pretty negative on the issue. Maybe that point should be emphasized going forward.